A warm, welcoming and lovely family bed & breakfast surrounded by greenery, yet only minutes away from the centre of town. Average rating 9 from 86 reviews. The Rose Apple is an 18-room little haven, with bright, clean and airy rooms that are beautifully decorated and look out on to the saltwater pool or nearby fields where ruminating buffalo and cows ponder the world and their next mouthful of scrubby grass. Downstairs an open-fronted restaurant and bar with an open kitchen helps you to really feel that you’re staying in someone’s home rather than a paying inn, and that is the aim of the owners who are always on hand. There are also plenty of books and games at hand, in case you don’t fancy striking out for an afternoon, or day. They have a strong commitment to maintaining environmental standards at the hotel too, hence the saltwater pool and energy-efficient lightbulbs which they had to ship back from Europe, as well as to delivering a higher standard of service than you might otherwise get at this room rate. The owner, Tim, says that the mattresses are as good as you’ll find in any five-star hotel and the rooms have black-out curtains to keep out the 06:00 sunshine, and they have worked hard at ensuring that their breakfast is top notch too. Included in the room price, the all-star breakfast includes (if you can eat it all) cereal, fruit and yoghurt, with toast and crepes, omelette or poached eggs, with tea and/or coffee. After all, a good night’s sleep and a good breakfast are essential to serious templing. Down a dirt-track road at the top of Sok San Road, this is only a ten-minute walk away from the centre of town, yet is able to maintain a completely different atmosphere. 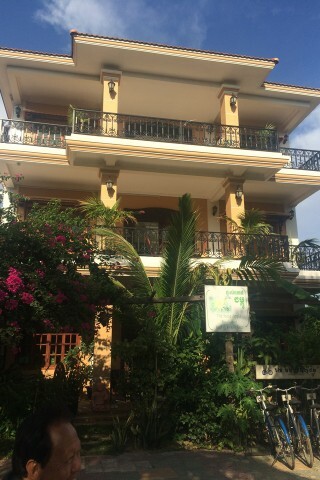 This is a very personalised guesthouse, with real commitment and real standards. BTW beer fans: Tim is Belgian, so this is also one of the only guesthouses with a stock of Belgian bars in the bar, which is, quite frankly, a marvellous way to end a day of templing. The prices below may vary depending upon occupancy. Recommended. Check rates at The Rose Apple on Booking.com. Room: Sgl air-con private bathroom, low season: US$35, high season US$50. Notes: Includes breakfast and pick up.